IAQ 4000 is a latex metal coating that inhibits rust on ferrous metal, galvanized metal and other surfaces exposed to general industrial and atmospheric conditions. The water-resistant coating can be used on new and previously coated roof decks, metal paneling, structural steel, corrugated metal siding, and miscellaneous iron and bar joists. Remove all oil, grease, dirt, loose or scaling paint, rust, mil scale and other foreign matter. CLEAN ALL MOLD INFESTED SURFACES WITH IAQ 2000 SERIES DISINFECTANT/CLEANER. Surface oil should be wiped off with mineral spirits and a clean rag. Prepare ruptured or scratched surfaces as for unfinished metal. Spot prime bare ferrous metal as conditions dictate. Fiberlock IAQ 4000 can be applied by roller, brush or airless spray. Stir thoroughly with a lifting action to fully incorporate pigments. Fiberlock IAQ 4000 is supplied at application consistency, but can be thinned sparingly with water to improve application consistency if necessary. Apply with appropriate application equipment. Apply 2 coats of Fiberlock IAQ 4000. Finish coat will seal spots of ‘flash rusting’ which may appear on ferrous metal after first coat. Clean tools and drippings with warm soapy water before Fiberlock IAQ 4000 dries. Dispose of all waste according to all existing local, state and federal regulations. Store in a dry place at temperatures between 40°F (4.5°C) and 90°F (32°C). Stir thoroughly. Do not mix with any other coatings, solvents or colors in oil. 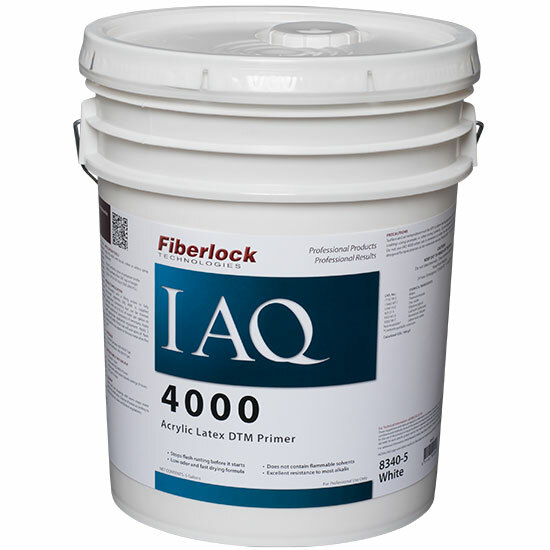 Do not apply Fiberlock IAQ 4000 when air or surface temperature is below 50°F or when drying conditions are poor. Keep from freezing. IAQ 4000 is not designed for tank interiors or immersion services. When applying with a sprayer, wear a NIOSH approved respirator with any R, P, N or HE filter.